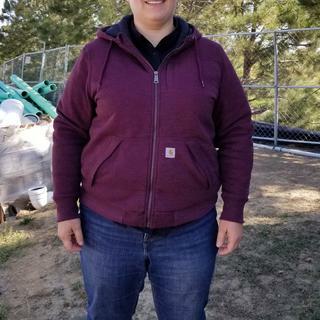 Ranch work or carpentry, this women's sweatshirt offers the comfort and easy range of motion of a hoodie with the warmth and weather resistance of a jacket. A quilted nylon lining runs throughout, including the arms, so there's no binding as you reach or swing a tool. This rugged layer is water-repellent, so you stay dry in light rain. Machine wash cold like colors. Do not bleach. Tumble dry low. Cool iron. Do not iron ornamentation. Just got this coat about a weekday ago. Absolutely enjoyed it. Then yesterday I went to pick up my daughter and there was a little bit of tension on the seam along the inside and it popped! Same thing on the inside of the left arm. Pretty bummed considering the amount of money I spent on the coat. We're very sorry to hear this happened. Please contact us at 1 800 833 3118 for assistance. My new favorite carhartt zip up! Warm & comfy! It's going to be a Favorite! ! ! More colors please! This is a Wonderful sweatshirt /jacket!!! I LOVE it. Looks Great and soft. Looking forward to many years of wear. Need more colors. Getting rid of all my other hoodies now. Thanks for a Great product! !!?????? I wore it out for the first snow storm this year. Stayed warm and dry. My neighbors were terrified I would freeze to death but I assured them I was plenty warm in the 2 degree weather. I have two of these and I work outside everyday all day long. They are warm and dry. The quilt lining keeps the wind out and the rain defender stays dry outside. The pockets are covered and the dirt stays out. 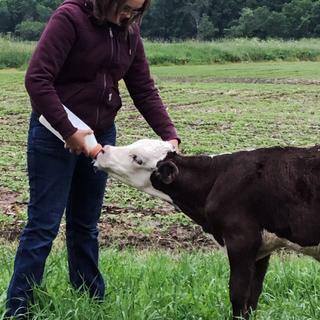 My daughters say it is warm but has mobility at the same time and they really like it. They have not worn it in wet conditions yet. Made doing pole surveys all day in 37F weather so enjoyable! The sleeve length was perfect, paired with the fleece lined pants made me very happy. Only wish the inside pocket either zipped or velcroed shut so I didn't have to worry about my phone slipping out. The outside zippered pocket was too small for my note9 but perfect for my id. Toasty - great for damp fall days. Quilting keeps me nice and warm. Love the color, more of a deep burgundy. Light rain beaded up nicely on the fabric. Sturdy zipper. Good fitting hood. Arms seemed a little snug at first, but seemed to loosen up a bit with wear. Runs slightly small, when compared to sweatshirts of 20 years ago (I realize fashions have changed). Sleeves are very narrow and because of quilt lining do not stretch. I always wear medium with this company, and do have arm muscle but this fit is for twiggy arms with only enough room for a light shirt. Also fabric in unappealing and does not feel good. Bought this for my wife, she really loves it. 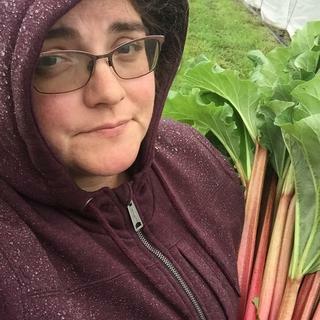 Absolutely love this sweatshirt for farm work on a cool damp day. Keeps you dry isn’t too bulky and the fit is great. Great for early damp cool mornings in the field picking produce. Worn on warm and on rainy days. Love the way it moves with me and doesn't ride up. Cleans up great. Multiple washing and it still looks good, and keeps its shape. The Rain Defender Rockland Quilt-Lined Full Zip Hooded Sweatshit (that's a mouthful!) is my new go-to hoodie. It is perfect for my morning chores and commute, when the cool Colorado weather is a little brisk. The hoodie is very comfortable and easy to work in. It keeps me warm, but the fabric is also breathable and doesn't hold sweat in. I like the ribbed bottom and sleeves which conform to my body and don't let cold air in. The pockets have storm flaps, which keeps all of my gear from falling out, and there are 2 additional pockets for cell phone- one on the chest and one inside the right hand pocket. The hood is big enough to accommodate my hard hat, but doesn't fall over my eyes when I'm not wearing one. The maroon color is really pretty, and I would definitely like to see more colors added to the lineup. I absolutely love this sweatshirt! It's perfect for those cool mornings where it isn't quite warm enough for just a t shirt, but too warm for a jacket. The color is beautiful, more of a maroon than a brown. I haven't had a chance to wear it in the rain, but the rain defender treatment has kept me dry while moving irrigation lines. The phone pocket might be a little small if you have a large phone in a bulky case, but it fits my Pixel just fine. All in all, this is probably the best sweatshirt I own. I absolutely love this sweatshirt! The color is not only beautiful, but also helps hide dirt and stains, and it's nice enough to wear to both work and to run errands in and not feel like I'm wearing a typical, frumpy, work sweatshirt. The rain defender works great, and the sweatshirt kept me dry and warm when stuck in a downpour. The front pockets take some time getting used to, but once you do, they're super convenient, and it's nice that things don't fall out of the pockets. The extra internal pocket is great for my phone or cash. I love that the quilted nylon lining also includes the arms, so those stay warm as well. You can move freely in this sweatshirt. As with most zip-up Carhartt sweatshirts I own, they tend to run a bit short in the arms and torso, but I believe that's just the Carhartt design and fit. I'd definitely buy this in a "tall" if they offered it. Other than that, this sweatshirt is perfect for cool days, and just about any activity! I’m really loving this jacket right now. It’s absolutely perfect for the coming fall weather. Warm enough for brisk days, but light enough to work in. I love that it runs a little bug making it perfect to layer heavier shirts underneath. I don’t love purple, but the wine Bordeaux color is actually great! Feminine but hides a lot of the dirt I end up in. The breast pocket wig zipper comes in prettt handy for things I really don’t want to lose, such as my phone. And I love anything with a hood. Keeps me cozy! I’m tall and it fit my longer torso really well. I would definitely purchase this coat. Especially if more color options were added. I love this sweatshirt! The first thing that attracted me was the great color. I was very impressed with the overall fit and comfort. It was a pleasant surprise to be able to wear the hood without it hanging over my eyes. The storm flap on the zipper is great, you can zip all the way up without any pinching or scratching on your neck. It is nice having a total of 4 pockets. The front hand pocket flaps are a little awkward at first when you slip your hands in but are great to keep your items from falling out. The quilted lining adds to your warmth and helps to keep the wind from blowing through and not to mention the fabric is water resistant! Nice work Carhartt a sweatshirt well done! 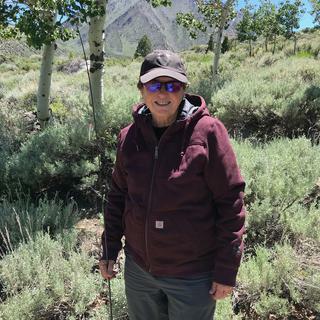 Caught in a brief but intense summer thunderstorm at 9800 ' and this sweatshirt proved it could handle the rain (good shedding) and the sudden drop in temperature. This was my first experience with a quilted lining in a sweatshirt and it was remarkably comfortable and non-restrictive. 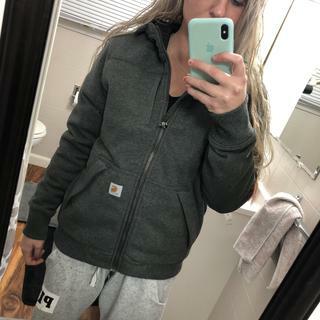 I wore it also on an early morning start to do some Sierran streams fishing and it was cozy and just right for the 34 degree start to the day. Updated version of the old favorite hoodie sweatshirt! This hoodie is basically my old favorite but with new ideas incorporated! I appreciate the rain repellent aspect, nothing worse than being caught in the "Back 40" in a sudden downpour! Love, love, love the flaps over the front pockets...finally a hoodie that keeps those pesky hay bits out and my cell phone in. The media pocket is too small for a standard cell phone, but is handy for other things. Love the front chest zip pocket for stashing a few dollars and my ID...phone didn't fit, but that's ok. The quality is truly Carhartt...well constructed, durable fabric, made to last. Cons: I normally wear a ladies large, but ordered an XL so I could layer it over other clothing. The sleeves are a good length when at rest, but when reaching or stretching, they really ride up and have to be pulled back down constantly. The forearms are too small, almost as if the quilting lining was a full size smaller...this contributed to me constantly having to pull the cuffs back down. I found that wearing this over anything more than a t-shirt was too warm. 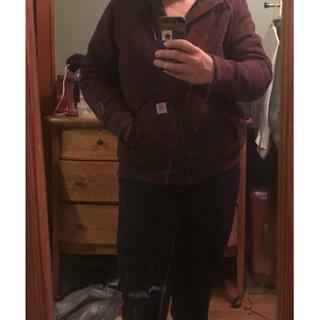 Not sure if the fabric just wasn't breathable enough or if it is a colder weather hoodie (I wore it during the spring), but I found that I was overly warm whenever I wore it. Probably great for the "always-cold" types! Overall: Great new concept, looks fantastic, probably more suited to cooler weather. Would I buy another...probably not...but only because I tend to be warm and need a hoodie that allows heat to escape. I prefer sherpa linings over quilted taffeta. Your feedback has been shared with our Product Design team. This hoodie should be your go-to when the skies look threatening and there's a chill in the air. The first time I wore the Rain Defender Rockland Quilt-Lined Hoodie, I was at a late spring baseball game. When I had grabbed it on the way out the door, I thought it might be a little much for the cool evening-- boy was I wrong! I was so grateful to have brought it along! The hoodie has a weight to it that speaks to the quality of the garment. The quilted lining feels durable and resistant to snags-- I have no doubt that I will never see the insulation that is behind the lining! The zipper is metal so I don't have to worry about plastic teeth breaking off or the zipper separating from the bottom. As well built as this hoodie is, my favorite feature is the weather resistant outer layer. There is *nothing* worst than wearing a traditional cotton hoodie once it has gotten wet from rain or melting snow (okay, maybe a couple of things-- but not in this context). This hoodie kept me warm and (my torso) dry during the rain delay of the baseball game I was attending. My companion had neglected to bring any outerwear and he complained bitterly for the final few innings, but I was warm as could be. 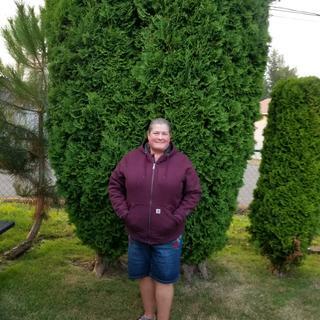 I think you will be as impressed with this weather resistant, quilt-lined hoodie as I am!! I really love this jacket. It's warm, but not too warm. 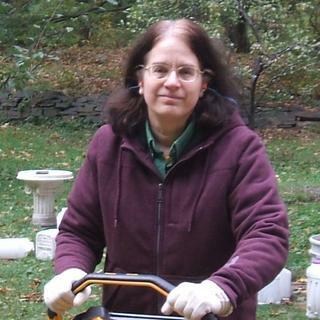 It will keep me dry and warm when we're out working, hauling hay, gardening, fishing, etc. But yet, it's not too much to wear in doors all day at work when they have the air conditioner cranked. One thing I will say is that you'll never look like a Rock star trying to put your hands in your pocket, so probably not the best to wear on a first date if you're trying to be smooth. But hey, if that goes awry you can always wow him with your gymnastic skills. You can stand on your head and nothing is coming out of those pockets! They are some seriously engineered pockets, but well done Carhartt, I do like them. Now that I am used to them, I don't look like such a tool, trying to put my hands in there. In all seriousness, this jacket is pretty cool. I love that it's rain resistant, and it looks great on. It's comfortable, and another really well made Carhartt product. I love the burgandy color and the softness of the material. The extra pockets are also nice. It's warm too. It fits well though my shoulders are larger than average so it's slightly snug along my back. Great sweatshirt! This is a great lined Sweatshirt/coat with Carhartt trusted quality construction and materials. Lately though Carhartt is making their clothing smaller and shorter in length. Arms on this are too short and so is the length of the sweatshirt. I now wear a solid large, but the large is too short for my liking and definitely the arms are short. I've never had this problem before. We are sorry to hear this and have shared your input with our Product Design department. Please contact us at 1 800 833 3118 if we can further assist in any way. 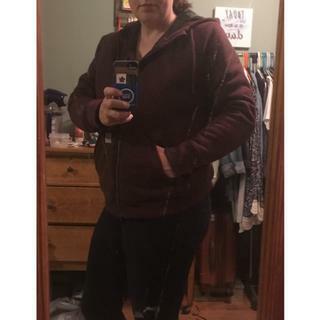 This sweatshirt is super warm and non restrictive which is a huge plus for me! I would recommend this product. This jacket is made of a very durable fabric, with a nice quilted lining. The pockets are amazing! At first, the front hand pockets look kind of strange, but after using them, they are a good idea. The flaps across the pocket make sure that even if you bend over, twist, or have to chase a maverick cow on foot, all the items in your pockets stay safe. There is an inner pocket in the hand pocket that is the perfect size for my flip phone. This little pocket is my favorite part of the jacket! The shoulders and upper arms are a little too snug, but this is a common problem with all clothing for me. If you have this problem too, I would recommend ordering one size larger. If you don’t have issues with shoulders, order your normal size. Overall, I really like this jacket, and highly recommend it! This jacket is permanently in my car now because it works so well. Keeps me warm and protected and fits really nicely. I can even bend over without worrying about my backsides peeking out which I love! My 2 cents worth about the Rain Defender Rockland Quilt-Lined Full Zip Hooded Sweatshirt. I loved this Sweatshirt!! It defended rain very will and stood up wonderful. The only problem that I had with it was that it was a bit small. I would need to go to a 3x in women's or a men's 2x. Can you please make this sweatshirt in navy blue? BEST ANSWER: We have forwarded this to our product team as a suggestion. BEST ANSWER: This style is not considered wind resistant. Very good wind resistance! It’s nicely lined, and good coverage. Not waterproof, but resistant, so I would say 9/10 for wind. I have a teen boy who is too small for a men’s small. Could this sweatshirt pass for unisex? I would think so. There is no feminine details to it. The main difference between mine and my husband's is mine is a bit trimmer around the waist and the arms are a couple inches shorter. It is a fantastic piece of outdoor clothing. I believe this sweatshirt is suitable for a teenage boy. It provides the same qualities as the men’s jacket and serves it’s needs very well! Even my boyfriend has said he liked the woman’s better than his own. yes, I have a women's small in the burgundy and my dad has a men med in the gray they are exactly the same sweatshirt. They make a gray in the women's that would work for a boy. I think it could definitely pass for a unisex sweatshirt, particularly in the carbon heather color. In my opinion this hoodie will not pass as unisex. Does this run bigger like the mens sweat shirts? BEST ANSWER: No, seems to run true to size for Carhartt. Normally wear Medium in Carhartt and the Medium fit great. No, wife says it fits like advertised. And she LOVES it. Rides horse in it says it's warm. Big hit. I feel it runs just right, the ladies size is fitted unlike the men's which is roomy.